This post has been viewed 3916 times. "But when the kindness and love of God our Savior appeared, He saved us, not because of righteous things we had done, but because of His mercy. He saved us through the washing of rebirth and renewal by the Holy Spirit." One night, 1886, in group of Christians were singing in a down-and-out part of a large city. A distraught young woman questioned if it would be possible for a sinner like her to be saved. Listening to her heart-cry for salvation, she was taken back to the mission and left with the ladies in charge. The young, wayward woman was brought to Christ that night. A situation was secured for her in a minister's family. Sometime later she became ill and had to be taken to a hospital. She rapidly failed and it became evident that she would not be long on earth. One of the gentlemen whom she had met on that night on the street, was visiting her in the ward. After quoting a few suitable verses of Scripture, he repeated her favorite hymn, All to Christ I Owe. Two hours afterward she passed away. Of course the greatest payment in our behalf is the gift of eternal life. It cost the horrible death of our precious Lord and Savior, Jesus Christ. He paid what we could not pay. He went to the cross voluntarily because He knew we would never be able to pay the cost. "Thy strength indeed is small! 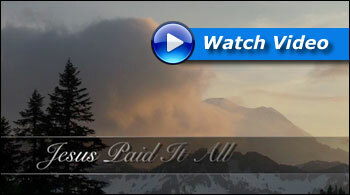 To access Jesus Paid It All, this week's inspirational video from GloryScapes.com, please go to: http://www.gloryscapes.com/jesuspaiditall/ in your browser or click on the image below.